The first thing you need when you create a new website is where you`re going to host your site.One of the very popular hosting sites out there is Bluehost. But what is Bluehost web hosting and why are they so popular?For starters, Bluehost has a very lucrative affiliate program so affiliates will promote the site to earn commissions.Bluehost pays over 5 million in affiliate commissions each year so everyone wants to get a piece of the action. If you look for Bluehost reviews, you`ll get contradicting reviews depending on which website you read.But one fact remains: Bluehost is popular with bloggers because of their affordable prices and the services they offer. I will assume you know a bit about Bluehost so I will not go into history here. Bluehost is a web hosting platform that offers cheap, but a great hosting service for any type of website. It was founded in 1996 by Matt Heaton and has become one of the largest brand names when it comes to website hosting. Bluehost is an official recommended hosting provider for WordPress sites in which WordPress users can take advantage of. With Bluehost, your website won’t suffer from slow performance or crashes even when there is a lot of traffic. This is something many website hosting platforms fail in on when hosting sites. They also offer a free domain for a whole year and a free site builder with templates. Well, “free” once you purchase one of their subscriptions. (check an earlier post here on how to build a free website). Money back guarantee. Yes, if you are not satisfied with the hosting you purchased you will be able to get your money back within the first 30 days! Different types of hosting. 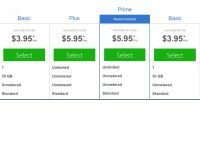 Bluehost offers 4 type of hosting plans: shared hosting, VPS hosting, Dedicated hosting, and Reseller hosting. 24/7 support. I have experienced horrible support on many other web hosting platforms, but with Bluehost, I’m actually impressed of how well they treat their customers compared to other web hosting sites. Although, they can take some time before they get in touch with you. It’s cheap! Most of cheap hosting sites always offer a bad service, while Bluehost is cheap, it also offers a very good service compared to other cheap hosting sites. Everything is unlimited. Domain hosting, hosting space, file transfer, email accounts. All this is unlimited! Free add-ons. Bluehost offers free site builder, domain name, and instant setup. Uptime. They guarantee 99.9 uptime. cPanel, which makes it easier for users to navigate. Slowness on re-seller accounts. Many users complained about how slow the websites are on the reseller accounts. Slow customer support (sometimes). As I said, customer support can be slow but is not always like that. Limited CPU Usage. The only thing that is limited in Bluehost is the CPU usage. So if your website is using a lot of CPU, they might suspend it. No company can be perfect, and Bluehost is not perfect either but in my opinion, they really offer some of the best hosting services out there. Like mentioned earlier, it is a cheap hosting platform that offers a great service compared to other cheap hosting platforms out there and is a highly trusted company. Now that you have read this far, you should already know that Bluehost is absolutely not a scam.You may find some Bluehost web hosting reviews with complaints but which site does not? Like I said, it is a cheap hosting platform that offers a great service compared to other cheap hosting platforms and is a highly trusted company. If you are looking for a new web hosting platform, Bluehost would be my suggestion. It works well for both beginners, advanced users and especially WordPress users. If you are interested in starting, feel free to visit their site by clicking the here. Want to create a website but not sure how it`s done? then I suggest joining the number 1 program I recommend where I learned to make money online from scratch.Not only is it free to get started, you`ll learn everything you need to make money online using your own website. Bluehost is user-friendly and you do not have to be tech savvy to get started.You can get your site up an running with little effort.Would I recommend Bluehost? sure I would. I hope you found value reading this post and it helped you make an informed decision if Bluehost fits your hosting needs. I am considering between siteground, guarantor host and blue host . I want better price and effective result in its use for any hosting site am considering picking. I think price is secondary when it come to efficiency in hosting your website,hope you find what works best for you. I’ve heard a lot of good things about Blue Host. May need to do some comparing when the time comes! Comparing is wise so you know what a program is offering you. I’ll have to check them out the next time I need hosting! You should give them a visit, they are beginner friendly and very affordable.